Geoscience Research Institute | Would You Move to an Exoplanet? If given the choice where in our Milky Way galaxy you would prefer to live, where would you go? To one of those newly-discovered extra-solar planets the media get enthusiastic about when water has been detected there? Before you answer these questions remember that, beyond the presence of water, many other conditions must be fulfilled before any planet can support the continued existence of life as-we-know-it, human life. Over the last 40 years or so, astronomical studies have taught us that our life on Earth is dependent on a number of physical and other conditions far beyond just the presence of water. The majority of almost two hundred conditions refer to the necessary characteristics of our planet itself (temperature, chemical composition, stability, etc.) as well as to the properties of, and our location in, our Milky Way galaxy (are there nearby planets, sources of harmful radiation, etc.?). These conditions include the following: Life on Earth requires a “just right” distance from our reliable source of energy, the sun. Earth’s chemical composition must contain those chemicals that are the main building blocks of human life: oxygen to breath, calcium to build skeletons, carbon to build carbohydrates and, together with hydrogen, nitrogen, oxygen and phosphorus, to make DNA. Earth needs a reasonably stable climate to allow food production to proceed along largely predictable lines; our Moon provides that stability for Earth’s rotation axis and its seasons. Our planet must not be too close to the centre of the Milky Way where deadly high-energy radiation would destroy life. In fact, even the universe as a whole plays an important role in the habitability of our planet. This includes the almost perfect electrical balance between positively and negatively charged particles to ensure that the universe does not expand too fast for stars and planets to form. The word “perfect” in this sentence means an accuracy of 1 in 1037 [this is a 1 followed by 37 zeroes!]. A similar balance governs the mass density of the universe which should not vary by more than 1 in 1060; too high and the universe would have collapsed long ago, too low and the universe would expand too fast for galaxies, stars and planets to form. No wonder we talk about these specific conditions as ‘fine-tuning’! The large number of requirements and their often narrow limits outside of which life could not exist already tell us that it may be difficult to find all of them fulfilled at a large number of different locations in the Milky Way. Add to this the fact that what we know about any extrasolar planets is still very rudimentary, and our search becomes like the one for a needle in a haystack. Since Earth offers a successful habitat for many life forms, in a first approach we should focus on Earth-size planets in extrasolar planetary systems: the distance from their star, the presence of water, the nature of its atmosphere, etc. For each host star these conditions are only fulfilled in a fairly narrow zone around it inside of which the planet must be revolving. This zone is called the Circumstellar Habitable Zone (CHZ) of that star. It will be farther from a hotter star and closer to a cooler star (Fig. 1). Fig. 1: CHZ (green) around three different stars; red zones are too hot, blue zones are too cold for life (courtesy NASA). Thus, our search for suitable planets must first focus on finding suitable host stars, preferable a little less massive than the sun. Such stars are known as red dwarf stars, which constitute the overwhelming majority of stars in the Milky Way. The next step is to find small, i.e., Earth-size planets that are most likely to be rocky and have a suitable atmosphere. However, small planets are much harder to detect than their giant gaseous neighbours. The temperature of the star and its planet’s distance from it tell us whether we can expect to find liquid water. In a few cases the planet’s atmospheric composition can be derived. Surely, before moving to any exoplanet, we want to know many more details that are not easily obtained. Therefore, even the simple question about the number of possible exoplanets fit for human life will probably not be answered today or tomorrow. 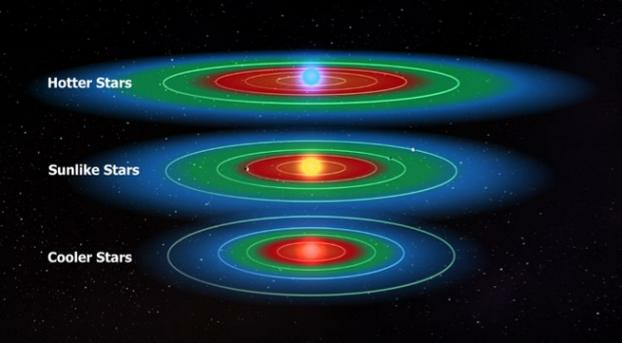 Because of the number of conditions to occur simultaneously, we do not expect to find many habitable exoplanets. The universe may turn out to be a rather inhospitable place for human life. Earth, if not unique, could well be one of a very small number of favourable planets. Considering the huge amount of fine-tuning required for a liveable planet, we should contemplate the possibility that the Creator of the universe has had a special purpose for creating Earth and its inhabitants, and that Earth’s uniqueness is a result of design rather than of accident.